"Before Kathy Wolfe, 62, started Wolfe Video in 1985, public screenings of gay and lesbian films were rare. She said that in 1983, when she was living in San Jose, she traveled to San Francisco and spent two hours standing in line to see the 1983 French lesbian film Entre Nous. The 1979 screening of the pioneering gay documentary Word Is Out at the Frameline festival inspired her to create her distribution company." 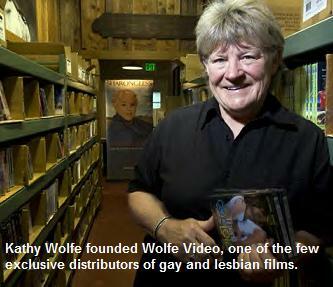 Over the past 25 years, Wolfe Video has worked to put gay media within mainstream culture. One of the few exclusive distributors of lesbian, gay, bisexual and transgender films in the United States, the company has helped to bring such award-winning films as “Big Eden,” “Brother to Brother” and “Desert Hearts” before television, movie theater and festival audiences across the country. For these efforts, Ms. Wolfe, 62, has become a heroine within the gay community. She has won numerous accolades, including, on June 3, a lifetime achievement award at the New York LGBT Film Festival.